Everyone loves a good myth and urban legend, especially if it keeps you up at night. We’ve heard stories of Big Foot and the Hermit of North Pond (that one turned out to be real!). And, of course, there is Wessie. Maine has no shortage of myths and urban legends to keep you entertained for years to come. Here are our 10 favorites. Back in June of last year, a Westbrook woman claimed she saw a “snake as large as a truck” eat a small mammal near the banks of the Presumpscot River. In August, a man walking along the river found the molted skin of a 12-foot-long snake belonging to an anaconda. No one knows for sure if Wessie exists, but she made national news. Much like the story of Wessie, a serpent-like creature lives in Pocomoonshine Lake in Washington County. Sightings of this lake monster who measures up to 60 feet long dates all the way back to 1884 where it was published in Algonquin Legends of New England. 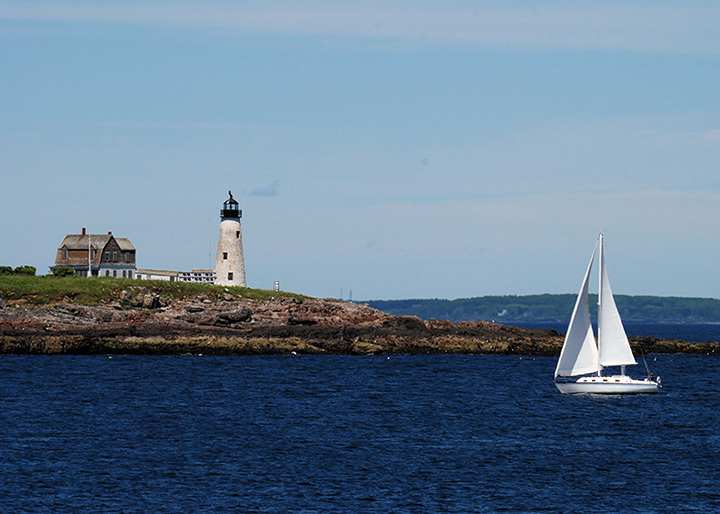 It is said that the Wood Island Lighthouse off the coast of Biddeford Pool is haunted by the ghost of Howard Hobbs, a fisherman who shot and killed his landlord and himself in 1896 after a drunken dispute over rent. For years afterwards, lighthouse keepers reported hearing moans and seeing unexplained shadows. Every college student loves a good scare. It is said that the Robie-Andrews dormitory on the Gorham campus of the University of Southern Maine is haunted by a former student. The Robie-Andrews dorm is the oldest building on campus built in the 1800s. Students have told stories of suicide and murder for years. Many dorm residents have heard noises and felt cold areas fueling the stories for new students. Sightings of the mystical creature, Big Foot, exists around the world, including Maine. In September 2015, a 12-year-old boy in Turner claimed he saw Big Foot in the woods. But, that’s not the first time people in Maine has claimed seeing. Early stories of this Big Foot like date back to Native American tales told by the Penobscot and the Passamaquoddy tribes. The tomb of Colonel Jonathon Buck in the small town of Bucksport has a mysterious stain in the shape of a woman’s stocking-clad leg. According to the local legend, Colonel Buck burned a witch at the stake and her leg rolled out of the giant bonfire. Heirs have cleaned the tomb several times, but the stain just keeps coming back. If this doesn’t give you nightmares, then I’m not sure what will! According to the local urban legend, a group of teenagers dared a friend to be lowered into an old well in Sabattus. The boy was lowered into the well until he couldn’t be seen by his friends. After the rope stopped moving, his friends pulled him back up, except the boy was changed. His hair was white and he had gone insane. You can hear his random screams from the windows of the county mental institution where he lives now. On a rural wooden road on the outskirts of Haynesville in Aroostook County, a newlywed couple were driving on a dark winter night when the drunk groom lost control of the car and hit a telephone pole killing himself. His young bride managed to crawl out of the car and tried to seek help along the road. Unfortunately, no one came and she froze to death on the side of the road in her wedding dress. People say that they still she her in those woods wandering for help. While most legends are just stories, a few are totally real, like Andre the Seal. Born in Rockland in 1961, Andre was abandoned by his mom. Rockport harbor master, Harry Goodridge, found him and raised him. Andre would spend his winters at the Boston Aquarium where he would then be released into the ocean and swim back to Rockland where he would live and put on shows for the locals and visitors. He died in 1986. We saved the best for last. For years, people in Rome found missing items from this summer lake houses. From bacon, to peanut butter, to batteries, to a pair of pants, homeowners knew someone was stealing stuff from them. Rumors of a hermit started after one resident came face to face with the man who took off in a canoe. All those rumors were true. In 2013, the police finally found Christopher Knight who had been living in the woods for 27 years. No one knows why, but we sure are intrigued by his story.